others marvel and say, �Your life is simply amazing�? 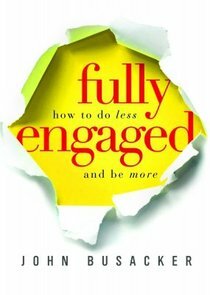 About "Fully Engaged: How to Do Less and Be More"
BUSACKER, author of 8 Questions God Cant Answer and architect of Life-Based Financial Planning, is</br> president of The Inventure Group, a global leadership-consulting firm, and founder of Life-Worth, LLC, a</br> life-planning creative resource. As a sought-after speaker and facilitator on self-leadership and</br> personal engagement, John has traveled to six continents.